Hawaii's Brandon Haislet slid safely into second as Sacramento State's Taylor Watanabe couldn't control the ball in the third inning last night. Haislet went 4-for-5 with two doubles. 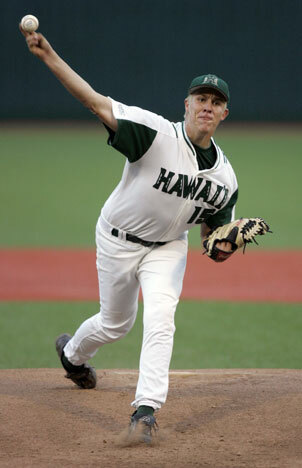 A much-needed victory by the Hawaii baseball team was overshadowed by an injury to its pitching ace. Junior Jared Alexander, the only Rainbow to have started at least one game every week this season, left the game in the top of the sixth inning with an injury to his pitching arm. Hawaii went on to defeat Sacramento State 8-3 in the opener of its final home WAC series of the season, but had concerns after the game on the status of Alexander, who lasted the minimum five innings needed to record his seventh victory this season. Brandon Haislet went 4-for-5 with two doubles and two RBIs as Hawaii (22-24, 14-11 WAC) inched within a half-game of Nevada for second place in the conference and remained three behind league-leading Fresno State. Jared Alexander improved to 7-3, but left last night's game after five-plus innings with an injury to his pitching arm. 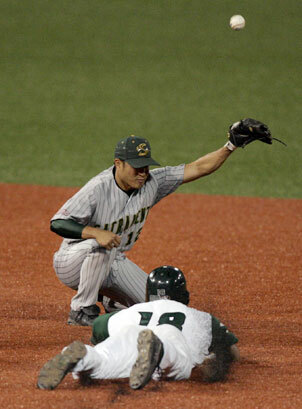 A change in scenery made for much better results for the Hawaii baseball team against Sacramento State. Vinnie Catricala went 3-for-4 with two runs scored to extend his hitting streak to a season-high 14 games as the Rainbows, swept by the Hornets in Sacramento, Calif., earlier this year, took the first game of the series with an 8-3 victory last night in front of a Les Murakami Stadium crowd of 1,755. The win could prove costly as Hawaii starter Jared Alexander was on his way to another brilliant performance until leaving the game in the sixth inning with an undisclosed injury. Alexander waved to the Hawaii bench after throwing the first pitch to David Flores with no outs in the sixth. He immediately headed to the dugout after Rainbows coach Mike Trapasso made his way out to the mound; Alexander was pointing to his right elbow as he left the field. "He said something's up with his elbow so that was it," Trapasso said. "The competitor he is, he's not going to come out of the game unless he's feeling some discomfort. We hope it's just a minor thing and we're going to reserve comment until we see what happens with the MRI." Cory Kahn replaced Alexander and inherited a 1-0 count against Flores with runners on first and second. A balk advanced the runners 90 feet and Gabe Jacobo singled through the hole between short and third to score Taylor Watanabe for Sacramento State's first run. Wes Oberlin then beat out an infield single that scored Ryan Blair and chased Kahn. Freshman left-hander Sam Spangler took his place and recorded the second out before a double by Jeff Hannah scored Jacobo to cut the lead to 4-3. Spangler wound up finishing the game by tossing 3 2/3 scoreless innings to pick up the first save of his career. "We went to Sam because it was left on left and he really did a nice job," Trapasso said. "He really helped our bullpen by finishing the thing." Hawaii's Vinnie Catricala accepted congratulations after scoring against Sacramento State last night at Les Murakami Stadium. The first two runs in the sixth were charged to Alexander, who allowed six hits and struck out five without walking a batter to improve to 7-3 for the season. After the Hornets pulled within a run, Jon Hee doubled with two outs in the bottom of the sixth to put runners on second and third and chase Hornets starter Jose Ramirez. Reliever Trevor Paine stepped in to face Brandon Haislet, who beat out an infield single to score Shane Hoey to push the 'Bows back up by two. After hitting Jeff Van Doornum with a pitch to load the bases, Paine got Kevin Macdonald to ground into a fielder's choice to end the inning. Hawaii added three insurance runs in the seventh on sacrifice flies by Landon Hernandez and Hee and a RBI single by Haislet to take an 8-3 lead. "We swung like we've been swinging for a while and we just have to continue that (today)," Trapasso said. Hawaii's 7-9 hitters came up big as Catricala, Greg Garcia and Hernandez combined to go 5-for-10 with four runs and four RBIs. Both teams were scoreless through the first three innings before Hernandez hit a two-run, ground-rule double in the fourth to give the Rainbows a lead they wouldn't relinquish. The series continues today with a doubleheader beginning at 1:05 p.m.
E--Catricala. LOB--SAC 6; Hawaii 12. 2B--Blair; Oberlin; Hannah; Hee; Haislet 2; Garcia; Hernandez. SF--Hee; Macdonald; Hernandez. SB--Garcia. CS--Watanabe; Blair. HBP-- by Ramirez (Garcia); by Paine (Van Doornum). BK--Baek; Kahn. Umpires--Kevin Sweeney (Plate); Dan Mascorro (First); Steve Corvi (Third).